After giving the Air Jordan 1 an absolutely attractive makeover, Michael Jordan’s famous shoe brand is set to unveil the new all-black edition of the Jordan 6 Rings that got a lot of positive feedback from the ever-loyal expectators. The Jordan 6 Rings will be released in Dark Charcoal colourway that is arguably the most attractive edition of the sneaker. 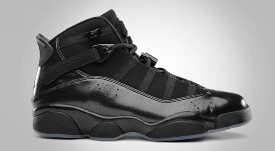 The new Air Jordan 6 Rings features a solid dark charcoal upper part and a shiny mudguard, a feature that the Jordan Brand incorporated to make it more appealing to the buyers. Check it this weekend and don’t dare miss it because it is one of the must buy shoes not only for this month, but for the entire year as well.